Aside from their delicate, beautiful clothes, Rodarte have found a new way to make everyone breathless. Through Jean-Luc Godard’s seminal French New Wave film “BREATHLESS,” that is. For the 50th anniversary re-release of the newly restored film by Rialto Pictures – it hits theaters in New York on May 28 – Kate and Laura Mulleavy of Rodarte created two limited edition t-shirts, one of which is inspired by the New York Herald Tribune shirt worn by actress Jean Seberg in the film, a ‘60s style icon who epitomized gamine chic. The other shirt will be an original Rodarte design inspired by the film. “We have been influenced by Godard’s rejection of the status quo and have approached our work with the same desire to create outside preexisting boundaries,” said Kate Mulleavy in a release. Both shirts will be at Barneys stores this spring in the U.S., at Colette in Paris and Dover Street Market in London with “Breathless”-inspired window displays in the stores as well. 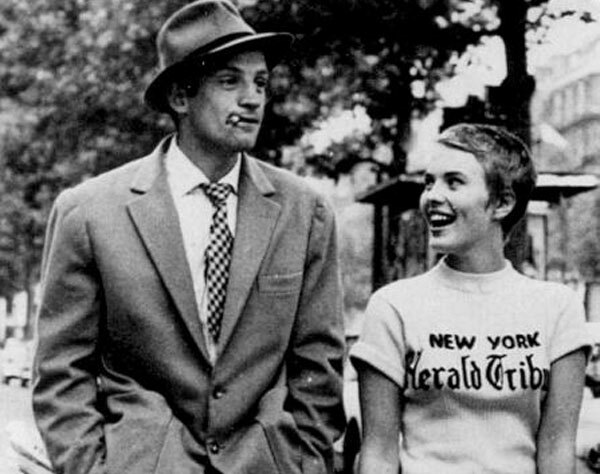 Godard’s “Breathless,” along with other French New Wave films, is credited with inventing a new kind of cinematic language with long takes, improvised dialogue and jazzy scores, as well as existential themes – while the cool style of its stars, like Seberg and Anna Karina, made them instant fashion icons.